Find Your Favorite Teenage Mutant Ninja Turtles Half Shell Heroes! You are here: Home / Great Deals / Find Your Favorite Teenage Mutant Ninja Turtles Half Shell Heroes! Parent of today’s youngsters grew up with the Turtles! They love their fun-loving, unique personalities and are watching the animated TV show with their kids, enjoying that balance of action-adventure and brotherly humor. Kids 2-5 are enjoying them as much as 6-11 kids! Moms of the youngest boys (2-4) may not be comfortable with the action figure aisle of the toy store. Half-shell Heroes to the rescue! They’re designed to be a child’s first Teenage Mutant Ninja Turtles – a safe, fun way to put that “big boy toy in little boys’ hands”. Young heroes will enjoy recreating Turtle adventures or inventing their own – controlling the action as imaginations soar in world of heroes and mutants, adversaries and allies. It’s a new adventure every time you play! 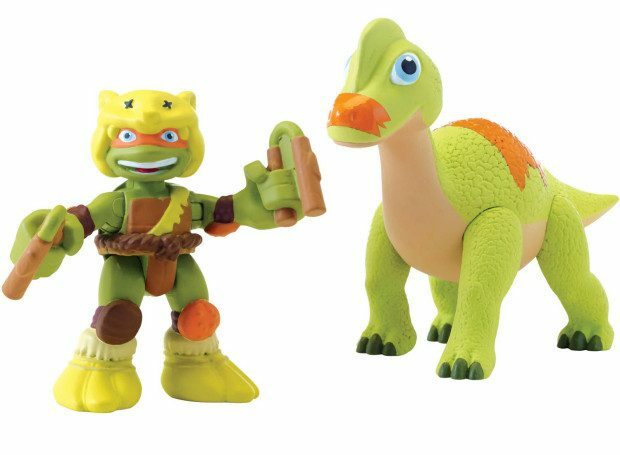 Half-shell Heroes feature the same Turtles and Mutants, but with brighter colors, softer expressions and play features that work with younger hands. All the Half-shell Heroes products are designed and tested for safe play by younger children, with rounded edges and no small parts. Get yours today at Toys R Us!